It is a difficult thing to accept the responsibility of what we do for, and more importantly to our children. This world we inhabit is not ours by right, we merely sequester some of its time from those who will follow. 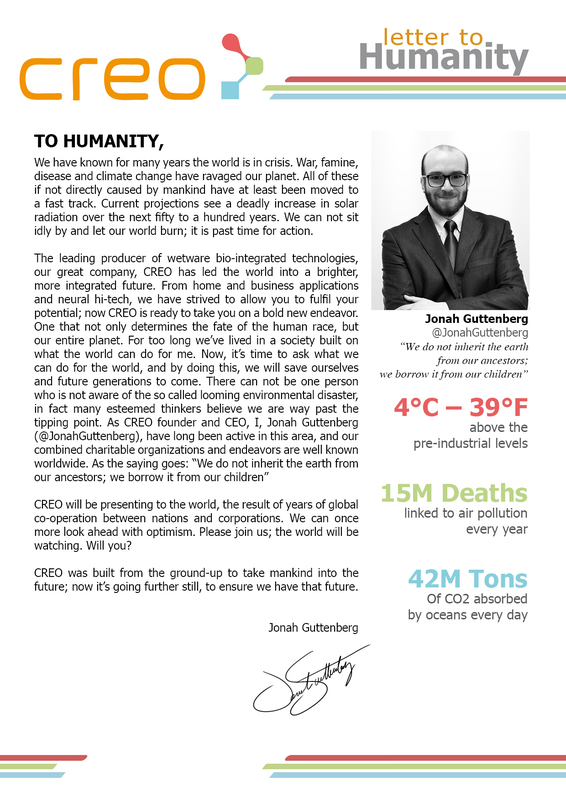 This is the message of the noble Jonah Guttenberg, a man of great nobility intent on ensuring a better world, a better tomorrow, for all of us. He is a great man who truly cares about all of us. Faced with the weight of responsibility for the havoc past generations have wrought on this immense rock we call home. The dangers of climate change must not be ignored, nor too, the Human contribution to its effects. But fear not, CREO have been working long and hard to not only stunt, but reverse the effects of anthropogenic global warming. The Surge of energy they have put into our lives is nothing short of miraculous. It is sure, future generations will look back on these times and remember, this was when the world was saved for all mankind.